NORWEGIAN MASS KILLER Anders Behring Breivik has renounced an inheritance from his mother to avoid it going to the state which wants to compensate his victims’ families, his lawyer said today. “It’s surely one of the reasons behind his decision,” lawyer Tor Jordet told AFP, confirming a newspaper report about his renouncing his inheritance to avoid it falling into state coffers. The government would have claimed the money to pay damages awarded to the families of his 77 victims by the Oslo court that sentenced Breivik to 21 years in jail in August last year. During his trial, it emerged that Breivik, 34, had cheated to avoid paying income taxes to a state that he vehemently opposed. Breivik’s mother died in March. The amount of the inheritance was not known, but her apartment was put up for sale today for around 3.7 million kroner (€484,000). Jordet said the right-wing extremist had renounced his share of the inheritance before his mother’s death. It is expected to go to Breivik’s half-sister and to charity. Breivik killed 69 people, mostly teenagers, in a gun rampage at a Labour party youth camp on July 22, 2011, after setting off a massive bomb outside the main government building in Oslo, killing eight. He had laid out his Islamophobic and anti-multicultural ideology in a rambling 1,500-page online manifesto posted online shortly before the attacks. 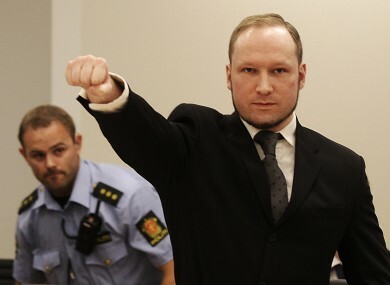 Breivik planned the carnage while living with his mother in the apartment in an affluent Oslo neighbourhood. He had moved back in with his mother in 2006, at the age of 27. He left in 2011 just a few months before the massacre, moving to a farm where he was able to obtain the fertiliser needed to build his bomb. Email “Breivik gives up his inheritance - to stop Norway giving it to his victims”. Feedback on “Breivik gives up his inheritance - to stop Norway giving it to his victims”.